Student and business-driven usability make it easier to learn, discover, and deliver the greatest individual performances. We offer solutions and practices as per your choice by delivering customized learning, supportive and mobile-friendly platform, and personalize the learning experience. 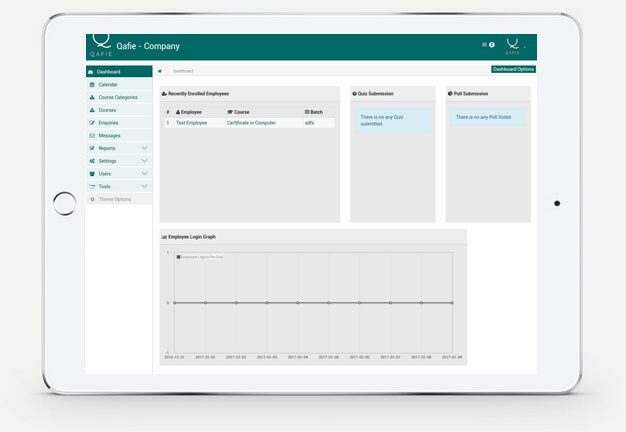 A cloud-based platform includes robust reporting, quick insights for timely guidance, fast analysis to help the weak performers, and deliver content based learning. The art of learning gets to stand on a new paradigm with technology making its presence in the world of training and education. An LMS, acronym for Learning Management System, is a software-based platform that artistically defines the learning mechanisms distinct from the traditional learning methods. To be more precise, a learning management system makes the art of learning systematic in nature. A learning management system software empowers you to create, preserve and deliver content to the online world with utmost ease and tranquility. The popularity of various LMS platforms started gaining prominence since the beginning of the 21st century. During its infancy, the online learning system started making its presence in the educational platform which later on spread its glory to the corporate and various other sectors. The Training Management Software is used to impart training to people from various backgrounds; be it a compliance training session or an educational training session, an LMS proficiently carries out its duty. The perfect blend of education and technology¸ that′s how e-learning coined its journey. The e-learning industry is one of the flourishing industries that makes way for a systematic online education along with managing content. Personalized learning, gamification, mobile learning are some of the advanced attributes that have prospered with technical inventions. Furthermore, with advancements in technology, the world of LMS will witness many new innovations making way for an engaging and convenient learning process. 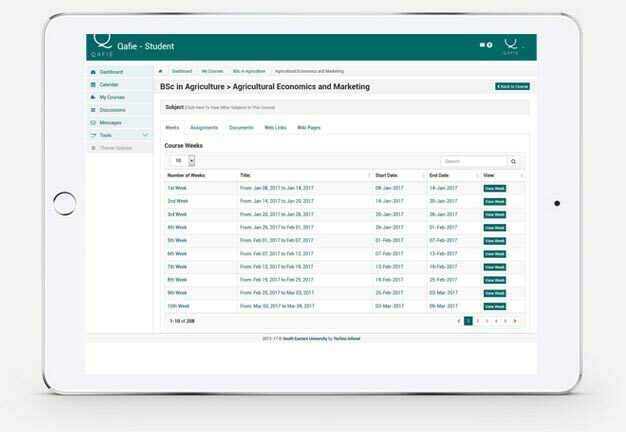 QafieLMS is one such learning management system that contemplates delivering quality online education across the globe with the major focus in countries like South Africa, USA, UK, UAE and India. Laying your hands on the Best LMS profoundly opens door to convenience that enamor accreditation from the learners as well as administrators who would be using this online software. 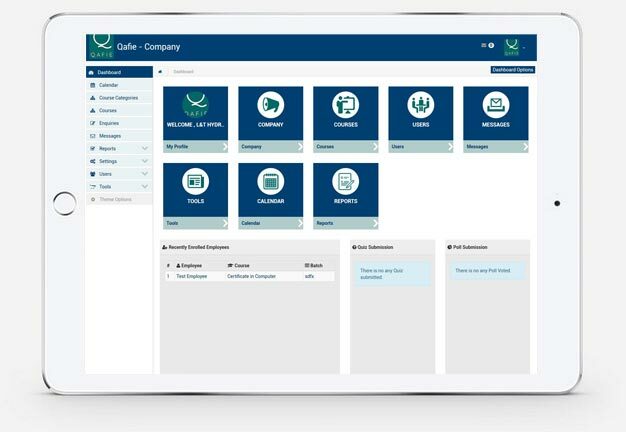 QafieLMS, a product of Qafie that has its roots in UK, UAE, India and South Africa, pumps up the learning process by perfectly blending in complex databases and digital frameworks for managing, creating, tracking and preserving content on the Online Training Platform. It covers two important domains: the university and the corporate world. Each and every domain resonates a well-rounded admin functionality and a handsomely presented training session built in the online world. The educational institutes believe in imbibing pedagogy that very well aligns with the current technological innovations. Having said this, an online learning system is one of the best practices that the 21st-century humanity would greatly benefit from. Engaging learning sessions, the enthusiasm to learn something new, availability of the content, widening learning scopes, etc. are some of the attributes that are indicative of a Great Online Education Software. A diversity in the course content and the chances of missing out on some important sessions are some of the reasons that necessitated the demand of an LMS in the educational sector. The need to foster an enthusiastic and ever jubilant work environment, inducing timely training, induction programmes, orientation programmes, compliance programs, etc. demands a tailor-made e-Learning System. This fortifies all the training needs that a corporate organization could confide in. Moreover, the LMS platform would be judiciously stripped down to managing, imparting training and carrying out various admin work that perfectly coins the best of both worlds. Government agencies to have a plethora of employees that are indicative of a competent human resource management and the need for timely training sessions to keep them ahead of the race. With a training management software, the employees can stay updated on the latest government policies, compliance regulations, etc. A learning management system software initiates continuous learning; be it in an educational institution or a corporate organization. It could be very well referred to an infinite repository that sees no boundary when it comes to storing learning materials. Easy to understand and implementation are some of the qualities that define the authenticity of the best LMS in the market. Here are a few advantages that each and every LMS proudly flaunts. Educating a student or an employee requires you to shell out your money on hiring a trainer, arranging a place, arranging for the required material, etc. With an online training software, you can easily cut down your expenses when it comes to educating a student or training an employee. All you need would be a device on which the relevant courses could be accessed and an internet connection. It has the capacity to hold contents without any definiteness. The admin can very well create and edit relevant content for the users which will be found in the online world. Moreover, no employee or student gets to miss any training sessions as the content will always be available on the online platform. The online training software is a cloud-based learning system that has made it easy to store all the contents in one place where any person can access the content at anytime. The user can access the content whenever the need arises irrespective of the geographical location or the device on which it is being accessed. Whether it is a desktop or a mobile phone, online training platform makes its way to the user without any inconvenience. 24X7 availibility of content makes it convenient for the users to access the learning sessions at any point in time. This helps in information retention as there is no restrictions on accessing the content. Reports, assessment tools, etc. keeps a track of the learner′s performance. A course management system does not limit its capabilities to incorporating and imparting knowledge, rather it also helps in keeping a track on how well the learner gets to understand the learning sessions. To be precise, the training tracking software helps in keeping a watch on the learner′s performance report. The online learning management system artistically integrates the social media icons so that the users can share their progress reports and opinions to the online world. This will make way for social learning, wiping out the element of isolation that the learners would otherwise be facing. Nowadays, all LMS platforms have the ability to galvanize social learning in the online world. The plethora of eLearning tools justify the innovative learning sessions that can easily find its existence in the best online learning platform. The learning sessions can be easily constructed and chunked up into training sessions that the learners can access anytime and anywhere. Adding and editing content to an e-learning system is as easy as a piece of cake. This to a large extent tones down the time taken to create content for the users. In addition to this, the way in which the content is presented makes it easy for the users to not only go through the sessions but also retain the information with much ease and tranquility. Choosing the best online learning platform will definitely bear fruits in terms of learning and development process. An online learning management system has changed the paradigm of learning where a person can imbibe the right amount of knowledge, irrespective of the age, gender and profession. Hence, an e-learning software not only helps in the personal and professional development but also contributes to taking learning to a global platform that sees no geographical boundaries. It is the nuances of the e-learning software that makes it one of the most sought-after technical inventions in the market. Having said this, each and every course management system confides a set of components that define their authenticity. Here are a few standard components that can be seen in almost every LMS. Allows you to curate and edit contents that stands true to your needs and preferences. The ability to monitor and manage the number of users. A training tracking software that helps in self-assessment. The ability to view the contents in more than one language. A plethora of reports to track the performance of the users. Sharing of information and knowledge on social media platforms. Accessible on more than one devices. A plethora of e-learning tools that makes it easy to construct the efficiency of a learning management system. Provides synchornous and asynchronous communication process. No long term contracts. No credit card required.